There are plenty of places in the Netherlands where you can get away for the weekend, do something nice and enjoy some time away from the everyday stress. One of my preferred weekend destinations in the Netherlands are the national parks. There are 20 national parks and De Biesbosch is among my favourite ones – a natural reserve with unique flora and fauna. De Biesbosch is a natural park located in the provinces North Brabant and South Holland. Its origins can be traced back to the St. Elizabeth’s flood in 1421. The Dutch are very good at playing God, building islands, diverting rivers, changing landscapes. Well, De Biesbosch is one of those Dutch creations where nature has been given the main role. De Biesbosch is one of the biggest freshwater tidal wetlands in Europe, a paradise for birds and birdwatchers. It’s also the home of the beaver in the Netherlands. You might be also interested in my complete guide on the Dunes of Loon and Drunen National Park. This post has been last updated on 29 January 2018. If you travel by car, you can access the park either from Dordrecht, Drimmelen, Werkendam or Hank. You can’t really cross it, so you have to plan your itinerary well in advance, as it might turn out that you have to drive all around it to get at your destination. There are a few car parks where you can leave you car in order to explore the park walking or biking. A visit to De Biesbosch can be perfectly combined also with a city trip. If you are visiting Breda, ‘s-Hertogenbosch (Den Bosch) or Tilburg, you can opt for a day trip to this natural park. It takes only 20 minutes by car to reach the park from Breda, 30 minutes from Den Bosch and 25 from Tilburg. Should you stay in Den Bosch, here is my complete city guide. DISCLOSURE: This post contains affiliate links. If you purchase an activity via one of these links, I may earn a small commission at no extra cost for you. This is helping me to maintain the blog and pay for things like the hosting. Thank you for contributing to the existence of this blog! This is not a sponsored post. I’ve paid my stay in De Biesbosch, as well as all trips and the entry tickets to museum. There are quite a lot of B&B’s and hotels in the neighborhood, but if you really want to stay in De Biesbosch, then the only option is the Hotel De Brabantse Biesbosch. It’s a very charming and cozy hotel with direct access to the yacht marina. So, pretty convenient if you come by boat. You get out of the door and you are in De Biesbosch! The hotel has a restaurant with very decent choice of dishes. There are no other restaurants in a walking distance from this hotel, so if you are staying there, you are kind of stuck to the hotel & its restaurant, which we actually never regretted. Alternatively you can stay in Dordrecht, Werkendam or in the neighbourhood of Geertruidenberg. There are many boat trip services in De Biesbosch, but I would recommend you the Biesbosch.net and their zalmschouw (a Dutch type of boat). The owners will take you on a half-day or a day trip through the labyrinth of small rivers and creeks and will tell with passion about the history of the national park and its flora and fauna. They will help you with spotting rare birds and will tell you thousands of stories. We enjoyed a perfect day with them! I’m not often impressed by museums other than art ones, but the Biesbosch Museum Island really won me. It’s entertaining, it’s educative, it’s interactive and it’s made beautifully with a lot of taste. The building itself is an architectural jewel. It has been nominated for Building of the Year Award 2016 by the ArchDaily. There are walking routes with different lengths that will take you to the most beautiful places in De Biesbosch. At each of the visitor’s centres you can take brochures with the routes. Unfortunately, both websites are available only in Dutch. You can download here a brochure in English about De Biesbosch. De Biesbosch is perfect for a photography trip, especially if you love photographing birds and nature. Here you can download a map with some viewpoints and short walking routes in De Biesbosch. If you bring your own canoe, there are routes with various starting points: at the visitor’s centre in Dordrecht (here you can also rent a canoe), at Natuurpoort Vissershang, or at Drimmelen. 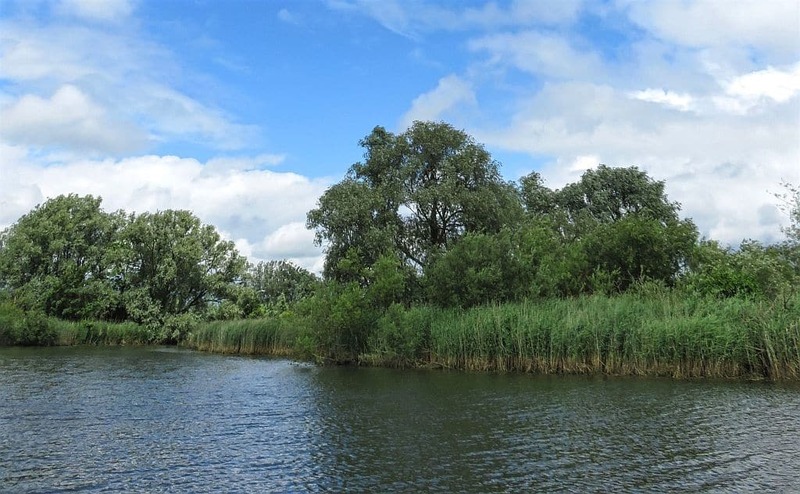 This is a great way to discover the enchanting nature at De Biesbosch. Which national parks in the Netherlands have you already visited? Which is your favourite one? I’m planning to visit all 20 of them. So far, I have I’ve been to 5 of them: De Biesbosch, Meinweg National Park, Dunes of Loon and Drunen, Dunes of Texel National Park, and the Hoge Veluwe National Park. Netherlands has so many great corners and the canoeing here would be so much fun! What a lovely place for a nature experience! Visiting National Parks is such a great slow travel choice since it’s usually not touristy and cheaper than going to a big city. Exactly! Slow travel makes you enjoy the place in full. What a perfect and serene little escape! Thanks for sharing. I’d love to track down the Nederland Beaver here ! Talk about serenity! This looks like the perfect weekend escape and I would love to do that boat trip! I I will definitely visit this serene place the next time I visit the Netherlands. I’d never heard of it, so thanks for sharing! The Netherlands is so beautiful! I only had 2 days in the Netherlands so I only got to Amsterdam and it was only after I left I realized how many wonderful places I missed. I really want to go back and see so many things, including this park! Each country has so many wonderful places off the beaten track that just wait to be discovered! Hopefully you can return one day to the Netherlands. If you need some fresh air in between – definitely worth the visit! This was a refreshing post. I love being able to get away from the city life and bustle to regroup in nature! I am looking for my reprieve in the Netherlands soon! Yes, you need to recharge your batteries from time to time, going back to nature. I love city life, but those little escapes make city life bearable. This is excatly my kind of activity. I love wildlife and nature. Going on a boat trip is great for those. This boat was so special. The couple that was doing the tour was absolutely adorable! Happy to have inspired you! I had never heard of the Biesbosch before – what a nice little retreat. It’s a pretty huge park, that’s not very popular. It’s good for an overpopulated country as the Netherlands to have such places… Pure nature.